This is an ancient church in India, the first Church in Kerala, India and the Asia itself, is considered as old as any other ancient Christian communities elsewhere in the world. It is estimated that the church was in existence at least from A D 52. This was established by St Thomas, one of the Disciples of Jesus Christ. St Thomas came to India to spread Christianity in the Indian Sub Continent and in Asia. In those days, The Europeans and later the Muslims of the Arab regions had trading contacts with the South West Coast of India. During those days the only important port known to the outside world in India is the Kodungallur (Crangannore – Muziri) now a small town in the Thrissur District. At that time this was the capital of Kerala under the Cheraman Perumals who were the principle rulers of Kerala. Kerala at that time used to be the area between the Arabian Sea (known as the Eritherian Sea at that time) on the West, Western Ghats on the East Indian Ocean in the South and Gokarnam in the North. As per the legend of the formation of Kerala we are told that the Lord Parasurama threw his maze standing at Gokarna to the South as per the advice of the Varuna Lord (Lord of Water) for bringing up the land from under the sea. The maze fell at the end of Kanyakumari and the land thus came out of the Sea is supposed to be the Kerala. This area was referred as the Malankara (mala = mountain and Kara = land) mountainous region. 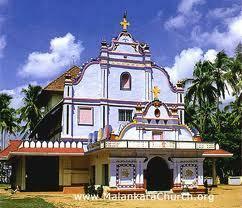 Hence the name of the Church in this Coastal area was called Malankara Church. The Christians of these regions were known as the St Thomas Christians or the Syrian Christians since the apostle St Thomas of Syria was instrumental in coordinating the Jews already present here and the conversions of the locals to Christianity and furthering the Christianity in the region since A D 52. This church is also known as the Indian Orthodox Church, Orthodox Church. This church had the status of the autocephalous (self headed or autonomous) church whose head has not to report any higher ranking bishop. However, this church maintains some connections with the Syriac Orthodox Church and its predecessor the Syriac Orthodox Patriarch of Antioch. Usually the churches will be hierarchical Christian churches. As indicated earlier Thomas Apostle (person sent on Mission – great moral reformer – highest ecclesiastical official) is considered as the founder or father of the Indian Churches came to the then port of Kerala, Kodungallur (Muziri) in 52 AD. He was a direct disciple of Jesus who took upon the mission of spreading christanism in India and around Asia. Those days, the contact of entire India and the Asia was through the port of the then Kodungallur (known at that time as Muziris) which was a very important international trade center having contact with the Europeans and the Arab world. This port of Kodungallur went into extinct due to the flood of 1341 AD which realigned the coast around this place and a new port the present Cochin came into existence. Traders from the above places used to come regularly for trade and gradually some of these outsiders started settling here and places around Kodungallur. To co-ordinate the Jews settlers and to further convert the locals, Apostle Thomas a Galilean by birth and one of the 12 disciples of Jesus came to Kodungallur. From the Muziris Thomas went to Palayoor a place near the present Guruvayur. Palayur was a place of Hindu priestly community. From there he went to the southern parts of Kerala. He established the Ezhara (7 & 1/2) pallikal (churches). These pallees are at Kodungallur, Palayur (present Chattukulangara) Kollam, Niranam (St Mary's Orthodox), Nilackal (Chayal), Kokkamangalam, Kottakkayal (present Paravoor) and the Arappally (half church) at Thiruvithankode a small town in the Kanyakumari District). 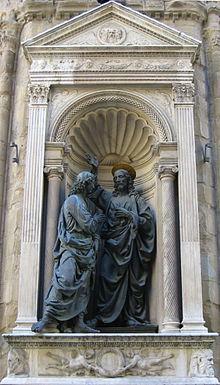 Apostle Thomas was also known as the Doubting Thomas and Twin. Let us see why he was known by these names. When Jesus was declared dead after stoning, his followers declared the resurrection of Jesus. 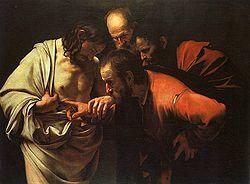 Thomas did not believe the resurrection and wanted to be convinced by physical touch. He was believed to have touched the wounds of Jesus living. After this he became a believer and became disciple of Jesus. Now his term 'Doubting Thomas/es' is used to describe persons who refuse to believe things without direct touch or physical evidence. At that time hi is the only Apostle who went out of the Roman Empire to preach Christianity. Besides India he is believed to have traveled in other South East Asian countries including parts of China. In the Gospel of John Thomas is referred as Didymus, the Twin. One reason for identifying him as twin is that he was considered as twin to Jesus as Jesus told Thoma that since Thomas is his twin and true companion, he can examine himself. Another factor is that in Aramaic Language Tau'ma or Toma is twin. From these words the name Thomas came hence he is known as the Twin. The Christians of Kerala are called as Nazaranees. The word Nazrani is plural of Nazra and is believed to have come from the place name of Nazareth the place f followers of Jesus. They were independent and were having coordination arrangements with Syrians and were following the Syrian Church practices for their religious matters and church matters. Till the arrival of the Portuguese there was no problem to the Christian community. The Portuguese were following the Roman Catholic System under the Pope. They were a dominant group and wanted to bring the Kerala Church and the Christian community under the Papal system (under Pope). With the arrival of Portuguese their missionaries also came. Their Christian Missionaries were very keen to bring all the churches in India – at that time churches in India were mainly confined to the Kerala coast and Tamilnad only –under the Roman Catholic headed by the Pope. The Portuguese Missionaries were successful in pressuring the representatives of the local parishes who attended the Synod (governing body of Eastern Church) of Diamper (foreign pronunciation of Udayamperoor) to accept the authority of Pope. Following this the Indian Churches were governed by the Portuguese Missionaries. They did not like the independence of the local church and started interfering in the administration of the church. This resulted in a general revolt ending in the 1653 Coonan Cross Oath. The local church was independent under Apostle Thomas. Originally the St Thomas Christians were having common leadership and ritual practices of the church of the east headquartered in Persia. Then the Portuguese missionaries came and tried to bring them under the Latin rituals of Catholic Church by pressure. This was resisted by the majority of the community and they joined the archdeacon St Thomas (a senior level clergy above the normal clergies but below that of Bishop) who was the head of the church at that time. They did a public vow or swearing to the effect of not to become part of the Portuguese Church or the Roman Catholic Church. This vow, swearing or oath is known as the Coonan Cross Oath. This happened on the 3rd January 1653. Now those who took the oath of Coonan Cross and remained to St Thomas are known as the Malankara Church followers. By this Oath the local church wanted to maintain its independence. This also had a problem for the local church in the sense that there was no Bishop for them at that time. Hence the local Christian representatives appealed to the other eastern churches for help. The eastern churches sent the Bishop of Jerusalem Gregarious Abdul Jaleel. He confirmed St Thomas as Marthoma (Mar Toma - Saint Thomas) I, and as the bishop. The Bishop and Mar Thoma agreed to work together to organize the Malankara Orthodox Syrian Church. Malankara Mar Thoma Syrian Church has a constitution evolved gradually from its experience of functioning over a time. It has adopted a system of democratic set up to decide about the administration of the church. The base of the administrative set up consists of all members of the Parish. A parish is the territorial unit like a village or a colony etc under the care of a parish priest. All members of a parish are automatically members of Idavaka Sangham (Idavaka = of the locality) (sangham = assembly) meaning the General Body of the local unit. They elect their representative/s to the Diocesan Assembly and the prathinidhi mandalam (representative council – Church Parliament) Episcopal (a head of religious institution like a Bishop) Synod (council of church). Diocese means an administrative area like the District, consisting of a number of parishes under the care of Bishop. The Mar Thoma assembly is known as the Grand Assembly - Episcopal Synod of the Marthoma Suryani Sabha Prathinidhi Mandalam to help the Bishop in the administrative matters and also to help the selection committee to select the candidates for the ministry of the church. The title head of the church is the Marthoma - Marthoma Metropolitan. He is selected from among the Bishops duly consecrated (solemn dedication) of the jurisdictions concerned. Normal practice is to select the senior most Bishop. If the Marthoma finds it difficult for him to manage the duties, he can relinquish the position and another person is selected for the position. In that event, relinquished Marthoma becomes the Mar Thoma Valia Metropolitan, Senior Marthoma Metropolitan. Metropolitans are assisted by episcopes and the senior most among them is called the Suffragan Metropolitan (deputy to Marthoma). Saint Thomas with the same name, as the founder of Christianity not only in Kerala but the whole country, was the main person of the church in Kerala and was also the head of administration of the church. But the history after the founder is not clear till the seventeenth century. The then Idavaka Moopens (parish elders) designated St Thomas as Archdeacon (Arkadayakon in Malayalam) to head the Christians of Saint Thomas. Subsequently a general meeting on 22nd ay 1653 at Allangad elevated him to the status to the Bishop titling him as Marthoma -1. It was akin to the prince and head of the community. It had such titles as Gate of All India and Governor of India etc. St Thomas had the sanction of the local kings of Cochin and Travancore and St Thomas had even a small army of Syrian Christian solders. This is the start of the reign of Marthoma Metropolitans. They are from the Pakalmattom family in Malankara. This family had the privilege of having the Marthoma Metropolitan continuously till the time of Marthoma IX. Then one Joseph Ramban of Pulikottil became a powerful person in the Christian community and the community identified him as the new leader. With this the continuity of Pakalmattom family for the claim of Marthoma Metrans came to a full stop. The new Metrans came from different families. In one dominant Roman Catholic St Thomas Christian Matthoo Tharakan of Thachil house captured the Marthoma VI and forced the church to conduct the mass in Latin catholic procedures. But immediately thereafter there was the Hindu Revolt under the lead of Velu Thampi Dalava. During this revolt, Matthoo Tarakan escaped and the earlier position was restored. The Bishops after the Metropolitan 9 was being more popularly known as the Malankara Metropolitans instead of the Mar Thoma. They were recognized by Royal proclamations of the Hindu rulers of the Cochin and Travancore kingdoms. The arrangement as per the Coonan Cross Oath did not last long and gradually differences arose between the local units. Some of the revolters who were with the Malankara Church at the time of Oath had rethinking pointing out that the Mar Thoma -1 was not ordained properly as Bishop and hence he could not be considered as Bishop and wanted to go back to be under the Roman Catholic Church. The original group in 1912 held a function at St Mary Church at Niranam. In this function one Murimattathil Paulose Mar Ivanios was consecrated under the name Baselios Paulose -1 by an ecclesiastical advisory body led by the Patriarch Ignatius Abdul Masih – 2. Among the Kerala Christian community those who supported Baselios Paulose is now known as the Malankara Orthodox Syrian Church. Those who opposed this and continued with the Syriac Orthodox Patriarchs are known as the Jacobite Syrian Christian Church. There were attempts to unite these two groups and partially succeeded between 1958 and 1975 but was purely temporary only. The church leaders and the decisions of 2 decisions of the Supreme Court could not make them to work together. The groups are operating as two separate churches now. The Indian Orthodox Church – Malankara Church is following the Alexandrian Christian community church and the Coptic (Oriental) Orthodox Church follows the West Syrian rituals. During the period the British East India has already established themselves and started expanding South wards. Eventually The East India Company power was taken over by the British Government. Eventually the British captured the Malabar in 1795. One of the British priests Rev Claudius Buchanan came to the St Thomas Church. The Malankara Church opened seminary (Theological College, or divinity school in theology) in Kottayam during the year 1815. In 1816 the British Missionaries joined this institution. However they started imposing the Protestant doctrines on the theology. This was resented by the Malankara Church and naturally they disassociated from the British Missionaries. This association of the British created one more division into the Christian movement in Kerala and the factions became three in numbers. The London Missionary became very active and the first English church was opened at Thalavady. This was inaugurated this British church in the house of one Itti Matthan Panicker. This became later the Church of South India. Vallarpadam Basilica Church, Ernakulam is a famous centre of pilgrimage. It is an ancient Christian Church located near to Vallarpadam Terminal. The church of Lady of Ransom in Cochin near to Ernakulam mainland, one of the pilgrimage destination and tourist attractions in Kerala.